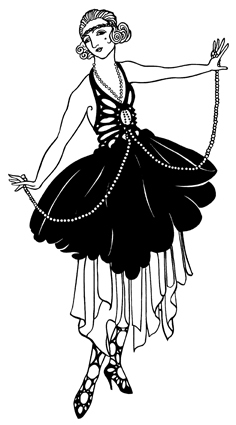 Did you get dressed up to the nines for a return to the height of the Jazz Age? The Beaux Arts Ball was held at the beautiful Perth Town Hall on Saturday, 6th August 2011. People are asking if it will happen again… and we’re not saying no. Our event was inspired by the Artists Balls and stage shows of the 1920′s and 1930′s, where artists like Picasso and Erte created costumes that blurred the line between art, fashion and performance. There was a Grand Procession of fifty “Living Works of Art”, and prizes were awarded by our esteemed Panel. There were brilliant workshops in headpiece-making, hairstyling and makeup thanks to Claire La Belle and Michelle Turner. Ticketholders were entitled to half price dance classes to brush up their dancing skills before the Ball at the Swing Academy at four convenient suburban locations. If you had your photograph taken at the Ball, our staff photographers can provide you with the digital images at high resolution for no cost after the Ball.